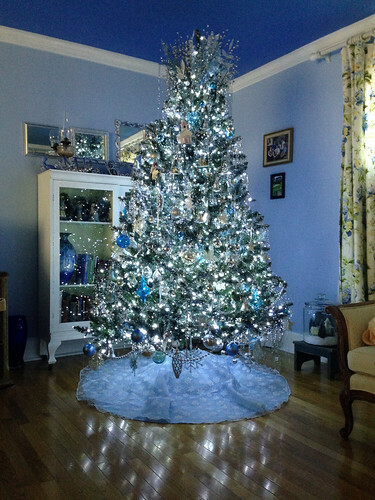 The Christmas tree in the downstairs bedroom has been dubbed “the blue and silver tree.” It is located in the 1960 addition to the original house. This addition has 8′ ceilings, so the tree is 7′. 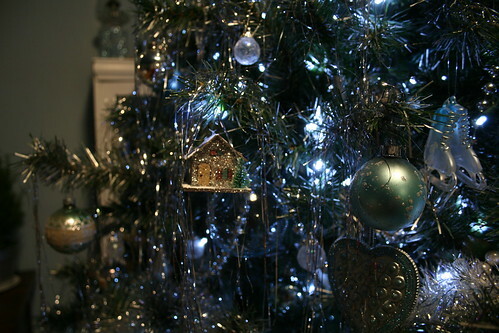 It is decorated with mostly silver ornaments, many of them with an old-fashioned theme, and some blue ornaments. 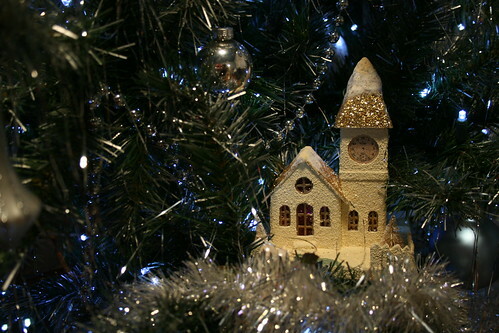 It has silver bead garlands, a sprinkle of silver tinsel icicles, and glittery picks for the topper. You can read about my experiment in spray painting this tree at this link: thanks, hgtv! Many of the ornaments for this tree are thrifted. My sister Genny haunts the thrift stores this time of year, finding some great items. Here are some pictures of the tree that I took a previous year. I’ll tell you a funny story about the silver ornaments that started it all… One year our church had a Vacation Bible School with a camping theme. They asked for the loan of artificial Christmas trees so they could set up a “forest” for VBS. We sent quite a few trees over. When VBS was done, friends gathered our trees for us and brought them back. DH took them back up to the attic where they waited for the holidays to roll around. When they did (roll around that is), we put up the twenty-plus trees that we usually decorate. Lo and behold, there was an extra tree. We could not figure out where this tree came from. We are sometimes given trees by people who are buying themselves a new tree and know how many we have up. They figure we can always use more trees. Which is right, in my book. 🙂 So we decided someone had given us the tree. I didn’t have any ornaments for it, so we bought a bunch of cheap silver ones and did it all in silver. We set it up in the dining room. The first week of December, we went to church to decorate the tree there. DH and I looked all over the church for that tree. Then it dawned on both of us at the same time! The tree in our dining room was the church tree! We had a good laugh over that, then had to go home, take the deocrations off, and take the tree to church to decorate it there. 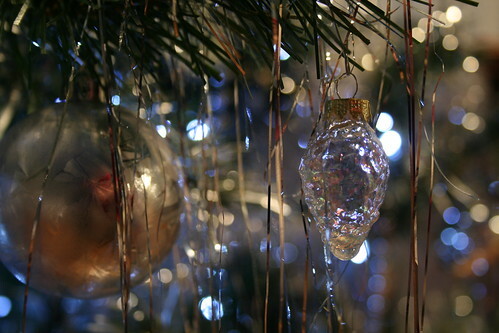 That left me with a lot of silver ornaments which I didn’t use for a few years. Then, in 2008, we redecorated the addition and suddenly the room had a blue theme. When it was time to decorate the tree, the Victorian tree we had used before no longer fit the room. That’s when I pulled out those silver ornaments. Silver and blue. Perfect for the guest room. We add a few new/thrifted ornaments each year and it is filling out beautifully. For a tree with humble beginnings, it has come a long way. 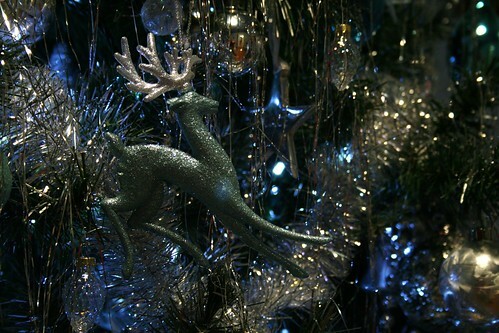 Most guests pick the blue and silver tree as one of their two top favorite trees in our home. It’s one of my favorites, too! This entry was written by ~~Rhonda, posted on December 4, 2014 at 8:14 pm, filed under Christmas, decorating for Christmas, trees. Bookmark the permalink. Follow any comments here with the RSS feed for this post. Post a comment or leave a trackback: Trackback URL.